It takes character to withstand the rigours of adulation. Two men who know what it is to receive the worship of the world met in Washington recently, and the outcome was intriguing. 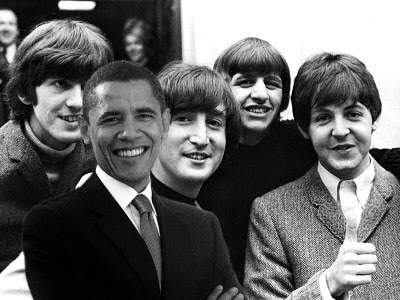 Last week, President Barack Obama welcomed Sir Paul McCartney, the most prolific of the Beatles, to the White House and awarded him with the Gershwin Prize, commemorating his magnificent musical career. The presentation was the culmination of a star-studded event, wherein Obama helped McCartney croon his old ballad, “Michelle” to the First Lady. Unless you happen to be a Gulf Coast resident who wishes Obama would call a halt to White House parties until the massive oil leak has been capped, I’m sure it was a touching moment. Maybe McCartney should have included “Fixing a Hole” in his playlist. This little dig was, of course, the one-millionth instance of some bien-pensant coming up with a new way to call George W. Bush stupid. As it happens, Bush’s wife was a librarian, so one assumes that as a young caveman, the future president would at least pop by the place to drag her home to cook the day’s hunt. But let’s say it’s true, and Bush is the most remarkable mouth-breather imaginable. So what? He will never hold political office again. Why sully a celebration by trashing a man who’s long gone? Obama has made a habit of blaming Bush for everything from economic collapse to vapour lock, but unlike McCartney, he has practical reasons for doing so. To wit, the longer Obama can blame Bush, the longer he can avoid criticism himself. Even so, in the whole history of humankind, scant few have ever been the objects of such global adoration as have Obama and Sir Paul. What, then, are they so cross about? Obama could be forgiven for being frustrated, as his presidency has not been the success folks expected. As leader of the hopey-changey crusade that swept the world in 2008, he had nowhere to go but down. McCartney referred to “the last eight years,” and it bears mentioning that Obama has been president for seventeen months. In that time, America’s budget deficit has tripled, unemployment has hovered around ten percent, and Obama’s approval ratings have plunged. The Beatles, too, began to crack at the height of their success, including the 1966 comment by McCartney’s song-writing partner, John Lennon, that they were, “more popular than Jesus” (Lennon claimed the remarks were misinterpreted; the Vatican posthumously pardoned him in 2008). Like many young people, I went through a “Beatles phase” (I have yet to experience an “Obama phase,” but anything’s possible), wherein I became a font of trivia about them. But one learns that everybody is fallible, celebrity notwithstanding. These men, Obama and McCartney, have had it all. They have been to the mountaintop, yet they are still capable of bitterness. How is that possible? Perhaps, to paraphrase another sensation, Shakespeare, the fault is not in our stars, but in ourselves. Maybe success and happiness are states of mind, no matter what the world thinks.